Sulzbach-Rosenberg. Once more, music will fill the city for two weeks. SRIMF, the Sulzbach-Rosenberg International Music Festival, has planned seven concerts, open to music-lovers throughout the region. 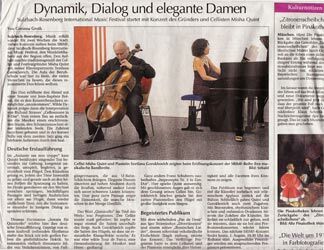 The opening concert was given, as is tradition, by cellist and festival founder Misha Quint and pianist Svetlana Gorokhovich. The auditorium of the Professional School was almost too small to contain the many people who wanted to hear this renowned duo. The duo began the evening with a sonata by Jean-Baptiste Bréval, which allowed the concert-goers to 'arrive.' Then, wild dynamism marked their interpretation of Richard Strauss's "Cello Sonata in F Major." From the first note, the musicians let loose a concussive storm, a suffering soul crying out in pain. The audience listened spellbound and, in the short pause before the second movement, could be heard audibly to exhale. In the "Andante ma non troppo," Quint's famous singing tone was particularly effective, congenially accompanied, accentuated, coaxed, even caressed by the piano. The artists were able to give intensity to each note, always maintaining the tension, especially in the quieter sections. In the finale, particularly in the piano, they alternated between effervescent, nimble passages and vehement outbursts, only to return to that delicate consolation, which, in their intimate dialogue, the instruments seemed to offer each other. 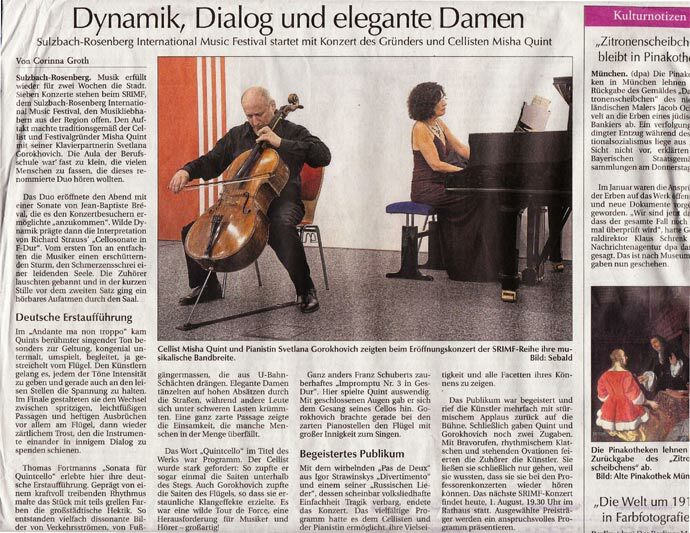 Thomas Fortmann's "Sonata for Quintcello" received its German premiere this evening, as well. Marked by a powerful, driving rhythm, the piece painted a picture of the hustle and bustle of the big city in garish colors. In the listener's mind arose a stream of dissonant images, traffic jam and hordes of pedestrians, pouring from subways. Elegant ladies sashayed through the streets on high heels, while others hung their heads, bent beneath heavy loads. A tender passage seemed to recall the loneliness which overcomes us in a crowd. The word 'Quintcello' in the title was programmatic. The cellist is set against great difficulties, once even plucking the strings beneath the bridge. Gorokhovich, too, reached in to pluck the strings of the piano, achieving astonishing sonic effects. It was a wild tour de force, a challenge for both the performers and the audience – fantastic! Franz Schubert's magical "Impromptu Nr. 3 in G flat Major" was another thing entirely. Here, Quint played from memory. Closing his eyes, he gave himself over to the song of the cello completely. Gorokhovich, particularly in the delicate passages, made the piano sing with great intimacy. The concert ended with the whirling "Pas de Deux" from Igor Stravinsky's "Divertimento" and one of his "Russian Songs," whose seeming folksy simplicity concealed inner tragedy. The diverse program allowed the cellist and pianist to show their own versatility and the many sides of their own talents. The audience was enthusiastic and, amid tumultuous applause, called the artists back to stage again and again. Finally Quint and Gorokhovich gave two encores. They were celebrated with cheers, rhythmic clapping and standing ovations. The audience only let them go safe in the knowledge that they could be seen again at the Professors' Concert in a few days. The next SRIMF concert will take place today, August 1st, at 7:30 pm in the Town Hall. Selected prizewinners will present an ambitious program.